tips and tricks – Jane Talks Tech! So, I finally got around to re-downloading Windows Live Writer which IS the dominant desktop software for creating/editing blog posts. 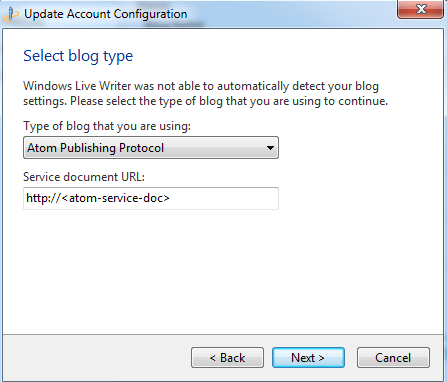 Setting up a WordPress blog is very easy in Windows Live Writer. In Habari, there’s just a little more work that needs to be done to simplify things. 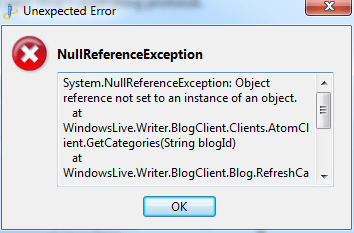 For starters, the metaweblogAPI method for posting is not enabled by default in Habari. A plugin does that trick and unfortunately, the documentation of that plugin does little to help you set it up through blogging clients like Windows Live Writer (WLW). Thankfully, andyc has a good post on setting up your blog via the metaweblogAPI method (it’s a link that looks like this <blog-url>/xmlrpc. 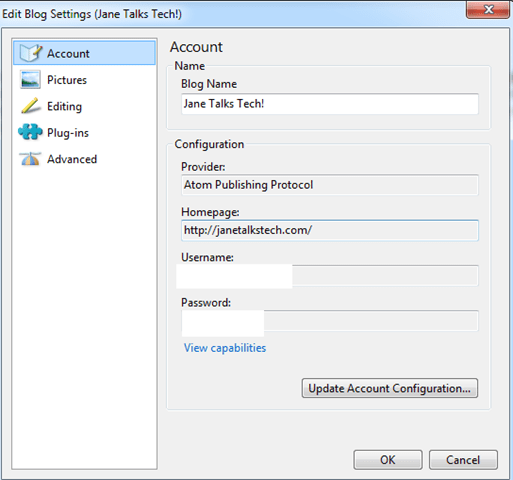 Make sure you have activated the metaweblogAPI plugin and specified directories to upload to). Furthermore, a Habari developer (michaeltwofish) informed me that Habari supports the Atom Publishing Protocol so I decided to give that a shot. Be aware that WLW will be unable to auto-detect your blog publishing platform at first and it will present you with a screen to pick your publishing protocol of choice as seen below. In the section where it asks for “Service document URL,” I put the atom feed of my website there on a hunch and it worked! In fact, this post is my first post via WLW using the Atom Publishing Protocol and I hope it works! This Atom Publishing Protocol method is not without its issues as I’ve already been greeted with this screen that tells me WLW was unable to find my blog’s categories (along with a slew of other things it can’t do. See Picture 3). Oh well, Picture 1 shows the screen you will be greeted with after WLW fails to auto-detect your blog’s publishing protocol. Picture 2 is just confirming my configuration in WLW. Picture 3 just how the capabilities of the Atom Publishing Protocol to my blog.